This is a concept to suit the following requirement. A boat that is seaworthy yet also beachable. To increase seaworthiness I have included a modest amount of waterballast to increase stability and a small cabin that provides protection for the crew. My estimate for appropiate water ballast is 80L to 110L. I anticipate it having the same effect as conventional internal ballast. For this concept I have chosen the Skylark 14 pram from Selway Fisher, although other boats may well be suitable. I have increased freeboard by two inches to keep water out and provide more protection from the elements. Freeboard is still much less that the John Welsford' Treadlightly boat. Whereas Treadlightly is a proper cabin boat, this concept is a skiff that has some protection from the elements. Inspiration for this concept comes from many sources. The voyages of the Wayfarer dingy to Iceland were one example. This voyage shows what can be done. I have tried to take this concept and hopefully make it less extreme by adding ballast and a small cabin. I have tried hard to keep the cabin very low in order to keep windage and topweight low. Should the boat be capsized the volume to the cabin would aid in righting. The sloped cabin sides provide a shape that can be righted easily from an inverted position. The twin masts provide good opportunities to string a boom tent between them for comfortable sitting space in light to moderate winds. The single crew sleeps with there feet aft in a footwell. This doubles up space between cabin and cockpit, allowing for more space in the cockpit and less changes in trim from when crew is in cabin or cockpit. There are watertight storage areas fore and aft. In addition there are many places for storage in the cabin. The cabin roof has a large hatch which hinges upwards to provide comfortable sitting up room. The boat has a double bottom which is filled with salt water ballast whenever the weather seems threatening enough to justify it's use. When low weight is preferred in light winds or to take the boat up a beach it can be drained. The version below shows a slightly larger cabin and a smaller cockpit. It would thus be suited more to one person due to the small cockpit. All of the above text and diagrams were drawn around 2008 (five years ago now), and since that time I have been doing a fair bit more rowing and learning a fair bit more. So based on that I think its time for an update. Doing it again what would I change. There are some little things wrong, for example the height between the thwart and the gunnel is too small, it will not allow the rower to use the oars properly. I may explain that the above designs come from a degree of context. 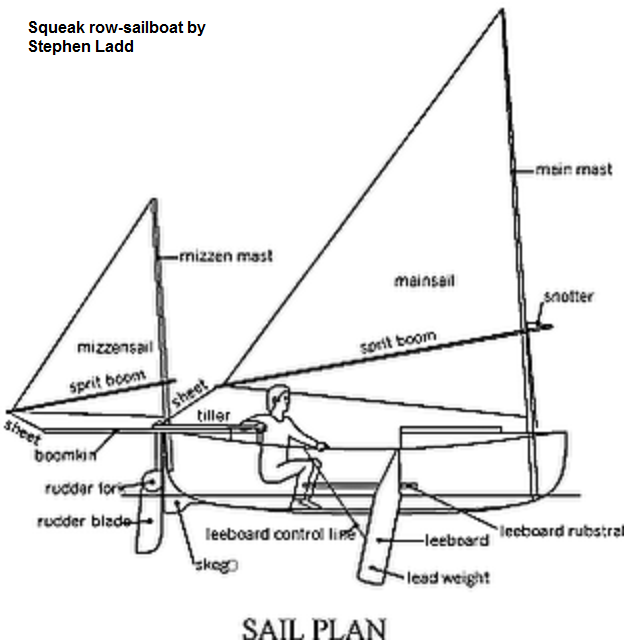 I read a book about this fellow Steven Ladd that had a 12ft boat called 'Squeak'. It was a hybrid rowing/sail boat and 12ft long. Steven Ladd rowed down the Mississippi, took a ship to the Pacific side of the Panama canal, then down the coast of Panama and Columbia, then inland, next down the Orinoco river into the Carribean, next he sailed and rowed back to Florida, great journey, book was very so-so. Journey took three years. Now Squeak was a small boat at 12ft but it still worked. The fellow had to save length by combining a thwart on top with a footwell when sleeping below. The end result was a fairly high freeboard. I would prefer a lower thwart position which gives a lower center of gravity for the rower, and allows for lower freeboard and hence windage. So I have made some changes, I have lowered the thwart, have also moved the rowing position aft a bit. I have shown a simple unstayed rig. I guess a split rig would work, although I orginally showed a Gaff rig, I think I would go for a sprit rig which has short spars which are easy to stow, or alternatively a single gunter rig (this is what I have shown). A gunter rig also has short spars which are easier to stow when not in use (smaller is better). A hybrid boat like this needs a fairly small rig, as sails are not for high speed, just there to keep the boat moving should there be a bit of wind. I have also shown a sloping backrest which is very good for comfort. Have also shown 3ft distance between aft end of thwart and rear bulkhead for people like me with long legs. For those wanting to build a boat like this, what do you have to do. For starters you need to get plans for a boat of roughly similar dimensions. Ian Oughtred Tirrik (16'9" x 5'4") possibly a fraction beamy and maybe too optimised for sailing over rowing. The Ian Oughtred Weymss skiff would be a better option at 16ft x 4ft 9" (looks about perfect!). The Swallowboats Storm 15 skiff at 14'9" x 4'9" (possibly a fraction short, may need to be lengthened). The Paul Gartside 'Open Water Cruising Skiff - Bob' at 15'11 x 4'9", would need a differnt rig, though it looks superb. A 16ft Peapod - plans available in the superb book "building classic small craft" by John Gardner - outstanding book!